You just checked your holiday shopping list again, and whoops, you forgot a few people. It’s okay, it happens, you’ve got this. 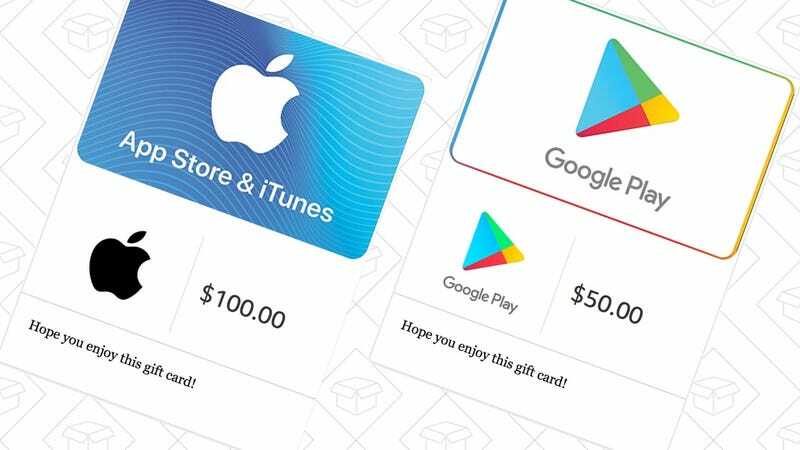 I’d say it’s pretty likely that your giftee owns either an iPhone or an Android device, which means they ‘d love to receive an iTunes or Google Play gift card to spend on apps, movies, music, and more. Today on Amazon, you can save $15 when you spend $100 on iTunes credit (it doesn’t have to be a single $100 gift card) with code ITUNES15, or take $5 off any $50 Google Play credit purchase with code GOOGLE. These are both digital gift cards, so there’s no need to sweat the shipping times. You can either print them out, or just email them directly to their intended recipient.